*Actual On Road Price of Ducati Multistrada 1200S at the dealership may vary. 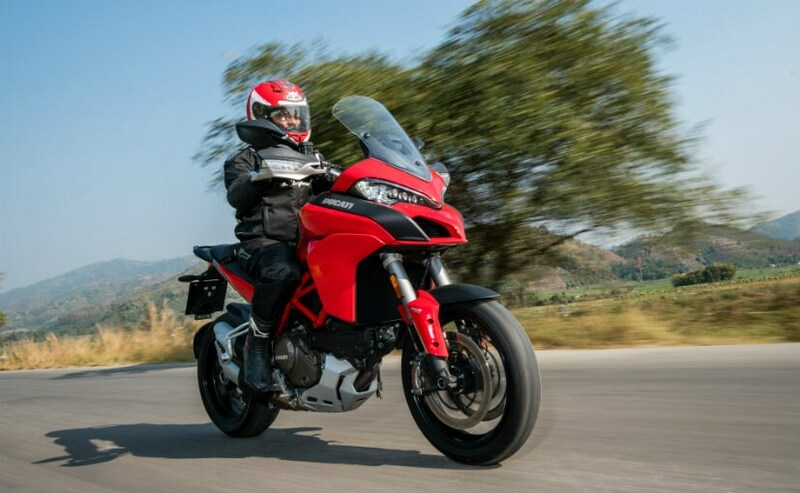 Ducati Multistrada 1200S looks like a tall and heavy bike, with a bulky front fairing adding height and width to the shoulder, sleek muscular surfaces and a sharp rear end. The front itself looks sharp too, with those LED headlight slits peering at you. Swing a leg over the Multistrada 1200S, and you immediately realise that it's got friendly ergonomics; and with a seat height adjustable at 825mm at its lowest, I could easily get both feet on the ground. 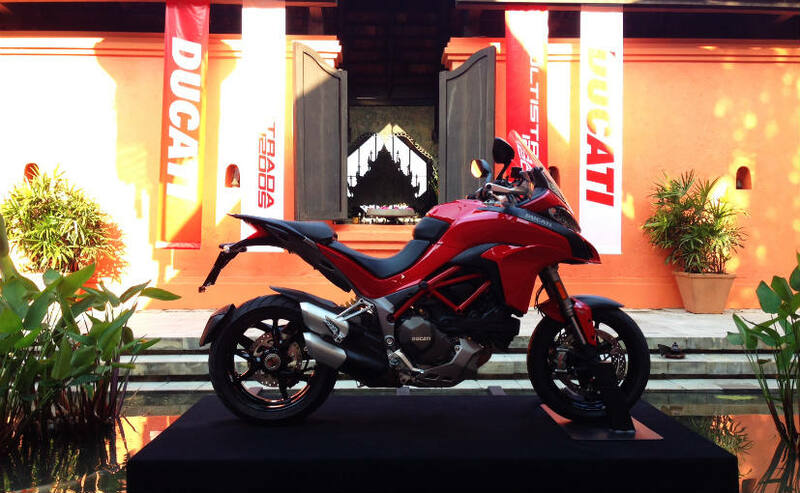 Ducati says the Multistrada 1200S has been developed as a "four bikes in one" concept. And at the core of this concept are the four different riding modes the bike comes equipped with - Urban, Touring, Sport and Enduro, with different power output, different suspension settings and different levels of electronic intervention the rider aids provide. And there is quite a bit of tech - ride-by-wire throttle, different riding modes, switchable ABS, traction control, wheelie control and even an inertial measurement unit, which measures signals through sensors and accordingly adjusts the suspension, ABS, wheelie control and the cornering headlights. 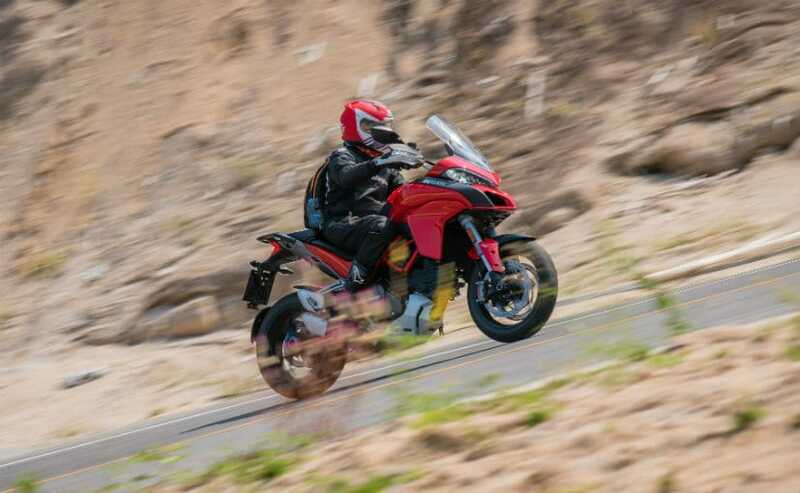 In essence, the Multistrada 1200S is a sport tourer really, but that concept makes it a sport bike, a tourer, a commuter and even an enduro bike, all rolled into one. At first glance, The engine starts with a familiar Ducati L-twin idle, and this one, the 1198cc Testastretta DVT is capable of belting out 160bhp of peak power. I toggle through the menu and select Urban mode. Power is restricted to 100bhp on this mode and throttle response is smooth and linear. There's also more electronics intervention in the ABS and TCS settings. Change the setting and select Sport, and you immediately realise how the suspension firms up below you. On this morning, I start with Urban to get familiar with the bike. A kilometre out of our resort, we cross the heart of the Golden Triangle, the confluence of the Mekong and Ruak rivers - the point where all three countries - Myanmar, Laos and Thailand can be seen from one vantage point. But we have work to do, there are miles to be covered on the Multistrada 1200S and sightseeing is left for another day. The first hundred kilometres or so, of the route chalked out for our test ride, is through highways, with sweeping bends and scanty traffic. The cruise control was set, and it works flawlessly, and you can set it between speeds of 50kmph and 200kmph, if you're inclined to cruise like that. I'm not one for cruise control, so you could either pull in the clutch or tap the brake, and cruise control is disengaged. I change the Riding mode to Sport; and to do that, you have to close the throttle and toggle the menu, but it's doable on the go. Once in 'Sport', the Testastretta DVT feels as if it's been rudely wokened up - the engine note becomes throatier, the throttle response becomes snatchier and you have the full 160bhp on tap. Downshift to second, open the throttle and the front almost lifts up; I guess, the Ducati Wheelie Control kicks in to ensure some sanity. The engine is typical Ducati, and before you expect parallel-twin or parallel-four refinement, it's an L-twin after all (Ducati-speak for V-twin) and at idle it may feel a tad vibey, but not so much to have any real complaints from us. The mid-range is strong and soon as you cross 3000rpm, the torque surge hits you, and you have a wide grin plastered on your face - this is a Ducati you are riding after all. The powerband is wide and high speed cruising is a breeze. 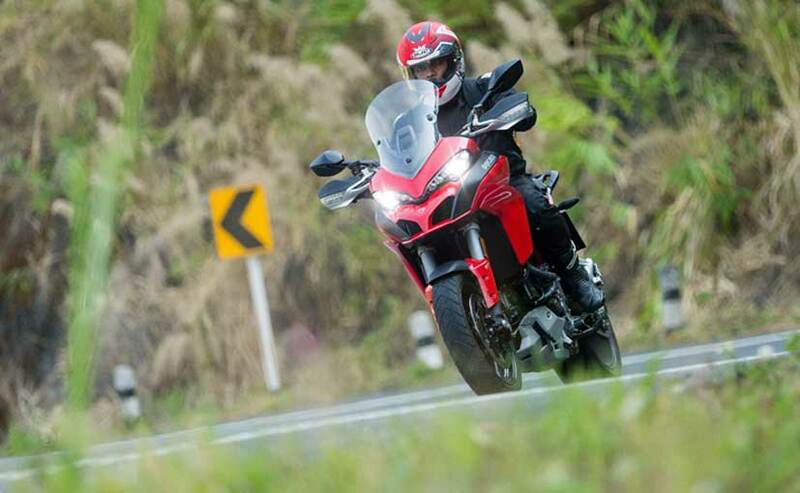 In fact, keep things relaxed and the Multistrada 1200S is quite the well-behaved tourer. The torque also kicks in nice and low, so you can just open the throttle at lower speeds without really needing to downshift a lot. Red lining though the gears however, you feel the vibes again towards the top end. And if you continue riding like that, your hands may sing a bit, but that is what the character of the engine is. Of course, there's no real complaint there as well, and on this ride, we didn't feel the need to really wring the throttle wide open to shift. We soon roll into the hills and in true, sport-tourer fashion, the Multistrada 1200S took to corners easily, and you can dip it in and out with ease, with a sense of confidence which will begin to grow on you. The tall height of the bike somehow doesn't make it sportbike nimble, and I for one, was going extra careful in the twisty hills around Chiang Rai. But nimble the Multistrada 1200S certainly is, and all that weight (209kg of it), seems to magically disappear when you're enjoying the scenery and some juicy corners in the mountains. The new Multistrada 1200S comes equipped with what's called the Ducati Skyhook EVO suspension, a semi-active Sachs suspension equipped with sensors which measure undulations and road conditions and in milliseconds adjust the damping and height. Of course, in each riding mode, you can also manually adjust the suspension settings. In default, the ride is supple, yet comfortable; minor undulations are dismissed with ease, without you feeling unsettled, even when cornering hard. Then, there's the inertial measurement unit from Bosch, the same one from the Panigale 1299 which measures inertial signals like roll rate, pitch rate, longitudinal acceleration, transverse acceleration and vertical acceleration. The IMU also provides lean and pitch angle data for the cornering ABS, the semi-active suspension, the wheelie control system, as well as the cornering lights. Brakes are high quality with a superbike oriented set up and they work flawlessly, with the combined set up and ABS. Overall, our 320km ride included road surfaces varying from super smooth, with minor undulations and broken patches, and the bike sailed through these conditions with full marks. 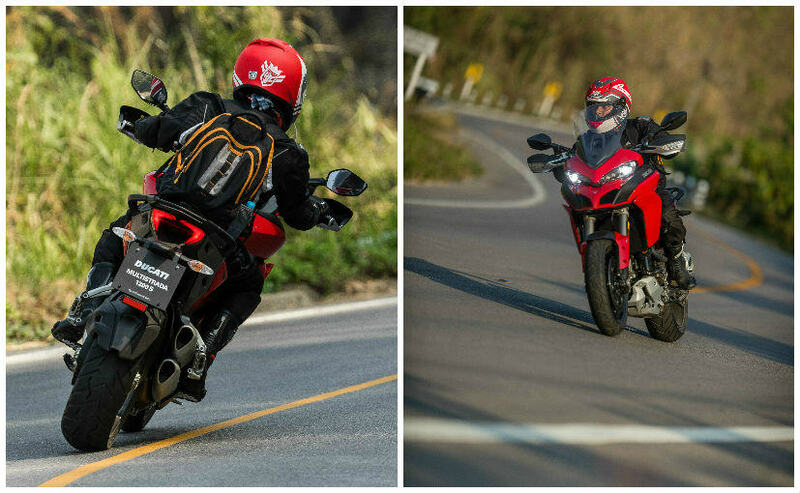 Is the Multistrada 1200s for you? 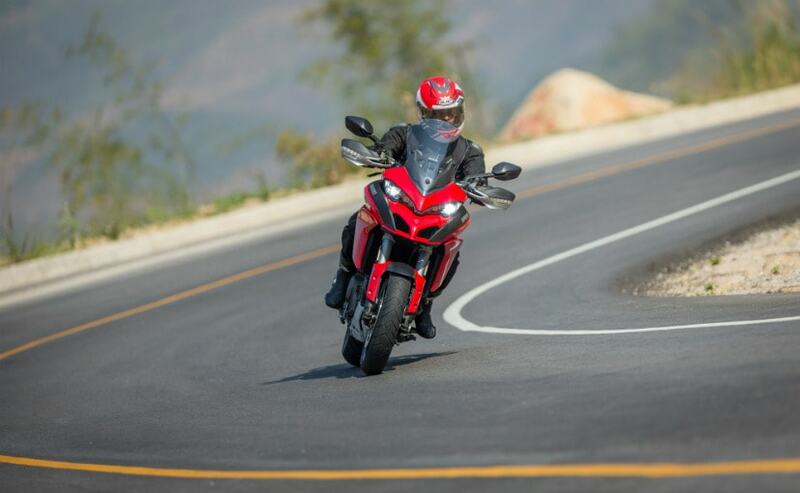 The Ducati Multistrada 1200S is a high-end, sophisticated motorcycle. Loaded with electronics derived from superbikes, it certainly isn't a simple motorcycle in tech terms. But it offers a whole lot of motorcycle, whatever your riding style is. 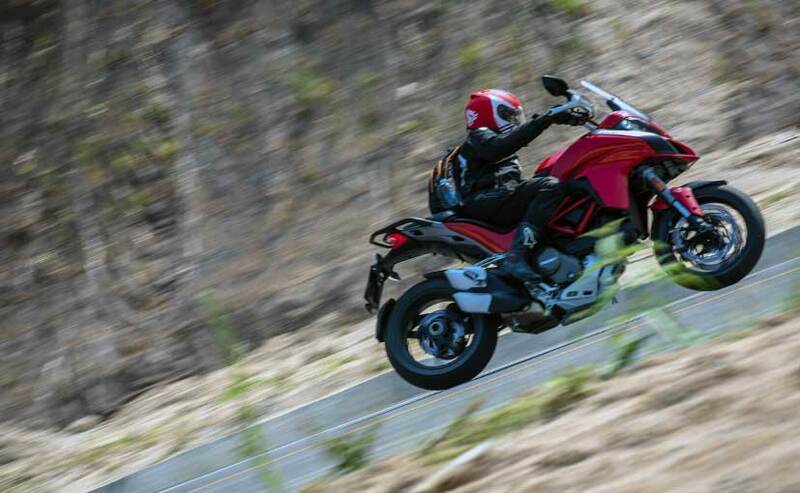 It certainly is a capable touring motorcycle and that's what it does best, providing hours and hours of comfortable, yet enjoyable and effortless cruising. The different riding modes and hi-tech equipment also makes it a versatile and safe motorcycle. Despite the high powered engine, Urban mode allows you to putter around town comfortably and even riders upgrading to their first large displacement bike will find the Multistrada a friendly and forgiving bike. Of course, for the adrenaline junkies, there's plenty of enjoyable performance too, if you're the kind who likes to dial up your riding experience a bit. For me, Touring mode offered the best of both worlds - full 160bhp power and a smooth power delivery at the throttle. At 16.6 lakh (ex-showroom Delhi), you get a hi-end sport tourer, which offers entertaining performance, great touring ability and a host of electronic gadgetry. 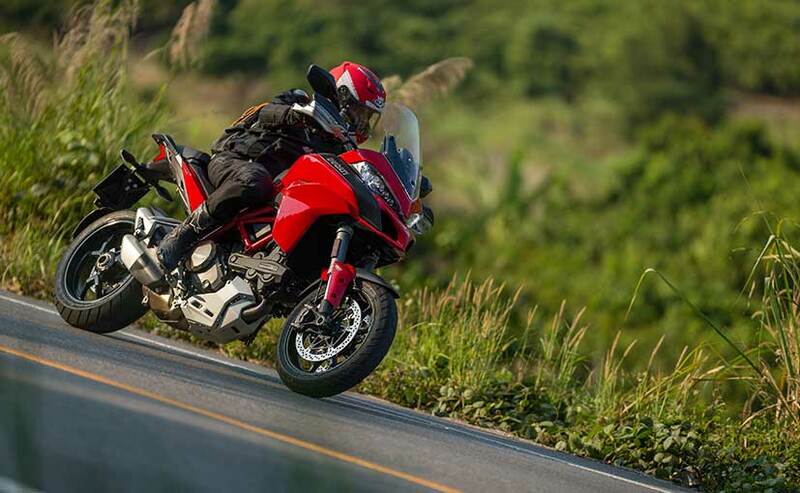 In a nutshell, the Multistrada 1200S is an easily accessible and rideable bike by a wide range of riders with varying levels of experience and skill. And that makes it a great bike which is certainly going to find a fan following, and a new breed of Ducatisti.